Lena Yantos, 93, of Kittanning, PA, died Friday, December 21, 2018, at Heritage Meadows Personal Care Home. She was born February 12, 1925, in Adrian, PA, the daughter of Michael and Adeline (Chicatini) Costanzo. Lena was a resident of the Kittanning area for most of her life and graduated from Kittanning High School. She worked at Montgomery Ward and Better Dairy before dedicating her life to caring for her family. Lena was a member of St. Mary, Our Lady of Guadalupe Church and enjoyed sewing and completing crossword puzzles in her spare time. 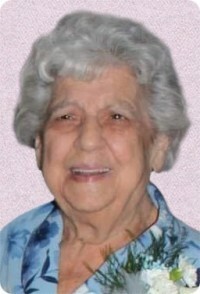 Her memory will be cherished by her sons, Gary P. Yantos and wife, Cindy, of Worthington, and David A. Yantos, of Arizona; daughters, Joanne M. Cagle, of Yatesboro, Susan E. Szymarek and husband, Mike, of Kittanning, Karen P. Olsen, of Margaret, and Lisa E. Stewart and husband, Dave, of Kittanning; grandchildren, Christopher Cagle, Ryan Cagle, Lauren Wheeler, Jacob and Marisa Crooks, Stacy and Jeff Sims, Daniel Yantos, Mackenzie Lemmon, and Aaron and Evan Shaffer; 15 great-grandchildren; twin sister, Lana Costanzo, of Mesa, AZ; and sisters, Theresa Krizmanich, of Ford City, and Mildred Keller and husband, William, of Seattle, WA. Lena was preceded in death by her parents; loving husband, Paul Yantos, whom she married July 30, 1949 and who died June 23, 2011; daughter, Mary Anne Shaffer; brothers, Anthony, John, Victor, Lewis and Joseph Costanzo; sisters, Katherine Palermo, Ann Costanzo, Mary Costanzo and Rose Balitski; and two stillborn brothers. Friends will be received from 3-7 PM on Wednesday, December 26, 2018, at the Bauer Funeral Home and Cremation Services, Inc., 515 N. McKean Street, Kittanning, PA.
A Funeral Mass will take place at 11 AM on Thursday, December 27, 2018, at St. Mary, Our Lady Guadalupe Church, Kittanning, PA, with the Rev. Victor S. Baguna as celebrant. Interment will be in Holy Trinity Cemetery, Ford City, PA. Contributions can be made in Lena's honor to St. Mary, Our Lady of Guadalupe Church, 348 N. Water St., Kittanning, PA 16201.